If your looking for a LogMeIn Pro alternative, you’ve come to the right place! Many IT people who use their Central product come to RemoteToPC looking for a LogMeIn alternative, but many small business users of LogMeIn pro are also starting to discover us as a much more affordable remote PC access alternative. 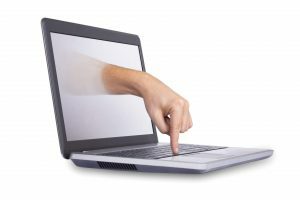 If you need unattended remote computer access for remote support, or if you just need because you need remote access into your computer at work, RemoteToPC will do the job, only for a lot less than those other guys. Following their widely publicized purchase of GoToMyPC last year, we were on the lookout for LogMeIn to raise their Central pricing this year like they did last January. 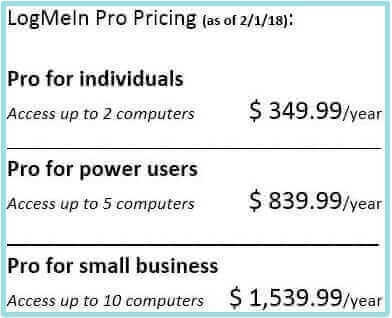 We were hearing new customers complain about the cost of LogMeIn going up back in December, but kept checking in and seeing that their Central pricing was not changing. We thought they had decided to not raise prices. We were wrong. Some internet searching again this week brought up a short post that Splashtop had made. It turns out that they were not going to increase price of the LogMeIn Central product this January, but instead they had a LogMeIn Pro price increase. According to their research into LogMeIn pricing history, this January was a 40% increase over last year. From $249.00 in 2017 to $349.99 starting in 2018. For accessing just a few computer systems, this no doubt seems an onerous jump in price to many corporate and small business users. Since RemoteToPC is made by IT people for IT people, most of our former LogMeIn customer base who decided to “LogMeOut”, comes from the LogMeIn Central product standpoint. However, we do attract a fair share of accounting firms, and other small businesses that just need remote access to PCs at a reasonable price point. For those small businesses that use PC’s we believe that RemoteToPC is an excellent and much more affordable LogMeIn alternative. RemoteToPC offers our Basic remote desktop solution to up to 10 remote PCs for $99 per year. We don’t anticipate that pricing changing anytime soon. While this is enough for most small businesses, we also offer 20 computer plans for small business. 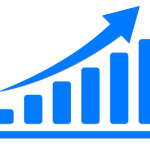 Our Enterprise level plans start at 100 endpoints per year. Enterprise plans come with additional features such as user management. User management allows you to assign which users can access which computers. As we’ve mentioned previously, LogMeIn began its rapid ascent into its current pricing levels back in January of 2014. That’s when they first started charging for their formerly free product. They added another increase in Jan 2015, skipped Jan 2016, and added another in Jan 2017. So, it seems obvious why everyone starts looking in January, because that’s the big month for upping their prices. Last year they bought fellow remote access product GoToMyPC (Go To My PC) for 1.8 Billion. This is sure to place them at over 1 Billion in annual revenue making them the 800lb gorilla in the industry. The move seems to have had the desired effect with LogMeIn stock prices continuing to go up. With those who jump off the LogMeIn ship, there are a number of products like Splashtop, or TeamViewer. We’d like to think that as far as more of a LogMeIn Central alternative, we have them all beat. RemoteToPC’s Command Center offers a clear view to IT people of all of the remote systems that they’re responsible for. System metrics give them alerts to troubled systems, and the way rows are laid out, access is quick and simple. The system metric monitoring that RemoteToPC does makes it more like the LogMeIn premium product. Splashtop and Teamviewer cost in the same range and yet don’t offer that kind of monitoring and alerts built into them. We’ve recently added Android support, along with Remote Reboot, Wake-on-Lan, and 2-factor authentication. When combined with other native features such as monitoring and alerts, file transfer and user management, RemoteToPC has a lot of premium features for a fraction of the cost of those larger competitors. Starting with the RemoteToPC Enterprise 1 plan multiple user accounts can be setup with specific access to specific computer systems. We don’t limit the number of sessions, so as many people as need to be can be logged in using RemoteToPC simultaneously. We believe that small businesses that are looking for a LogMeIn pro alternative should look at us. 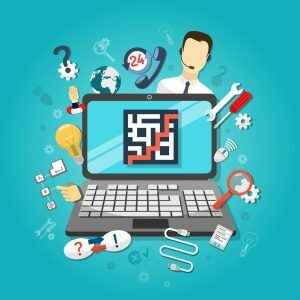 IT businesses, in-house IT staff, and MSPs should also look at us as a potential LogMeIn central replacement. We’re committed to high quality product support, and customers service, as well as adding new features, and continually improving old ones. Mac support, faster remote sessions, and remote printing should be coming later in 2018, along with more system information greater control over alerting, and remote remediation options. We want to provide you with the best product we can at an affordable price. We know what IT people need, because RemoteToPC is built buy IT people for IT people. Sign up for a free 14 day trial today and see what we mean! Is RemoteToPC a good LogMeIn Central alternative ? As IT people ourselves, and from some of the feedback we have had from customers, the ability to copy a file from one computer to another can be a critical need. For LogMeIn, they charge twice the money for this feature. When they first implemented their new pricing, it was file copying, and multi-monitor access that they used to force users up to their Plus plan. This was apparently too much for too many Basic plan customers, and they soon offered the multi-monitor feature back in their Basic plan, while leaving the ability to remotely copy a file in their Plus plan. LogMeIn’s Premier plan has robust monitoring and alerts for proactive monitoring of computer systems, but at more than 4 times the cost of their basic plan. 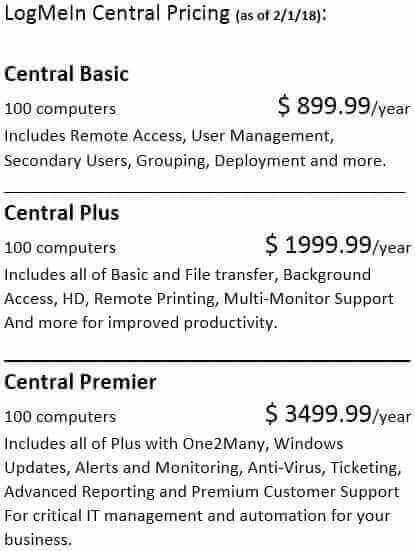 At the time this is being written, LogMein Central Pricing for 100 computers is: $699 a year for Basic, $1499 a year for Plus, and $2999 a year for Premier. We built RemoteToPC as a low cost alternative that has many of the same LogMeIn Central features, but have deliberately modeled our pricing to beat out their lowest price, while also offering key features that they feature in their higher level plans. RemoteToPC has a Command Center and Remote Desktop Access similar to LogMeIn Basic, File Copy similar to LogMeIn Plus, and we even offer basic Alerts and Monitoring similar to LogMeIn Premier. All currently at $299 a year for a 100 system plan. All of our Enterprise level plans include these features that LogMeIn Central plans do: Remote Access, User Management, Computer Grouping, Deployment, Computer Search, Online/Offline Status, 256-Bit SSL Encryption, Multi-Monitor Support, File Transfer, Alerts and Monitoring, Mobile Access to Alerts, Wake-On-Lan, Local Client Application, Remote Reboot, Safe-mode Reboot, and Premium Customer Support. For the features we offer, we don’t think anyone can touch our pricing. We think that RemoteToPC is a new kind of product. One designed to give you the best experience by merging the core features of advanced RMM tools with a basic remote access client, and that’s priced at a very low cost. We don’t think the cost of IT tools should be punitive. We know what IT people want, and need, because RemoteToPC is built by IT people for IT people! TeamViewer Hacked, is it worth the cost? I have seen two articles about some of our larger competitors in the past week. One about the TeamViewer hack and one about LogMeIn. The first was an article about how users were upset with LogMeIn price bumps. I have seen articles and users continually upset about that since they first started charging for LogMeIn back in January of 2014. In fact I was one of the users that was upset about the lack of a good and affordable alternative to LogMeIn back then, and that was one of the catalysts that drove the creation of RemoteToPC. This latest article that I read, it was not so much about how LogMeIn had continually bumped up prices, but how users were surprised by the charging of their credit cards without warning. When they first started raising prices, they often offered users a discount on the new pricing, but now it seems that they just charge them the new higher price with no warning at all. One user complained that because he was using it for 700 devices, his pricing went from $299 per year to $14,999 per year. That drove him away from LogMeIn to TeamViewer. His price with RemoteToPC would be $1999 per year, and he could add up to 1000 computers at that price level. For all of the disgruntled LogMeIn users, it’s not as if TeamViewer users are happy. Teamviewer pricing is based on a large upfront cost that many might feel was a bad investment because according to articles and lot’s of blog chatter, TeamVeiwer was recently hacked. Because of this allegedly massive TeamViewer hack, many companies that had been using TeamViewer are scrambling to find another more secure product. I was contacted by one IT company in Spain that was looking to leave TeamViewer for that very reason, and articles are all over the internet, and sites like Reddit. Others have also commented on the fact that TeamViewer has a nasty habit of unexpectedly requiring mandatory upgrades of customers who have already bought the product, raising the question how much does Teamviewer really cost them over time? Teamviewer should allow users to turn off automated updates of installed client host software, but I would suspect that this regular windfall of new cash for upgrades is built into thier pricing model. Ultimately, I really don’t consider TeamViewer an apples to apples comparison to what we offer with RemoteToPC, because TeamViewer does not offer any sort of system monitoring or alerts the way we do. I would categorise TeamViewer as more of a generic remote access application. Although we have some customers that use RemoteToPC to just access their work PCs from home, RemoteToPC was designed specifically for IT people, and so that’s why every install also includes system health monitoring. We could have designed a more generic product, but as our tag line says, RemoteToPC is designed by IT people for IT people. So what that means is that from our perspective any new RemoteToPC features will always have the IT person in mind.